Repurposed “We Buy Houses” sign in Eastwood. On every major street corner in my East End neighborhood, Magnolia Park, you’ll find “We Buy Houses” signs. Much of Houston has gotten so accustomed to these signs—especially post-Hurricane Harvey—that they barely even notice them. The motive behind these signs is, at best, predatory. Individuals purporting to be “real estate investors", more commonly referred to as house flippers (we’ve all heard the “Learn to flip houses!” commercials on the radio…it’s these folks), put out hundreds of these sign in rapidly-gentrifying areas in an attempt to lure in longtime homeowners in dire financial straits, with promises of lump sums and a quick close. In reality, they’re lowballing vulnerable people who may not be familiar with their grift, or with the current state of the housing market. So I notice these signs, as they’re expressly there to prey on my neighbors. On my friends. On my family. At first I staged a campaign to rip up every single one I came across, and a quick trip to the grocery store would lengthen as my fiance and I pulled over, hopped out, and removed each sign. Our home office slowly accumulated stacks of these signs and their stakes, and when we’d drive around our neighborhood again, more would be back, cluttering street corners. Sometimes the signs take a more ‘creative’ approach to the “We Buy Houses” slogan, instead sporting “My Daddy Buys Houses” or “Firefighter Buys Houses,” and often, they use fonts that look like handwriting to….I’m not really sure. Make their signs seem earnest and fair? Make them seem like the everyman? Either way, it seemed like a never ending cycle. We’d report the signs to 311 (please do so if you ever see any), and the city’s truck would come around eventually and pick them up, but they’d be there again soon enough. 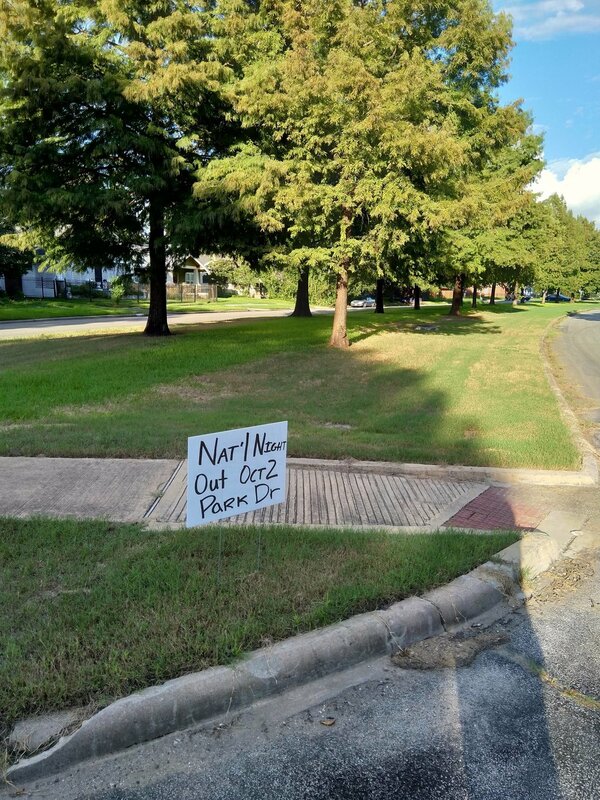 It was like the people hired to put these signs out saw an opportunity when a corner was devoid of them, instead of thinking that maybe the reasons that signs weren’t there was because neighbors despised them, wanted them gone, and took action. The East End Block Party solution? Why waste all of that material—technically sign-code-violating trash the second it gets stuck in the ground—when we could repurpose it for the benefit of our community! Since the start of this project, we’ve been ripping up “We Buy Houses” signs and repurposing them to advertise our own block parties; using them to make art projects; crossing out some of the words on the signs to say “We Steal Houses" instead (it’s true, y’all) and carrying them in the annual Cesar Chavez Day Parade and at speaking engagements; and most recently, using them to promote important community-building events like National Night Out! Turning these harbingers of gentrification into useful, informative signs, and giving them a second life by doing so, is an empowering reimagining that anyone could do. Make it a project for your church youth group, or for your Girl Scout troop. Turn them over and write positive messages on them, or add voter registration deadlines and dates, or turn up the irony and build a house out of “We Buy Houses” signs! There’s a world of possibility out there. So we got a little creative, and we hope you do, too. You don’t have to endure a never-ending cycle of predatory signage, and if you also happen to be a “We Buy Houses” sign eradicator, we want you to know that you’re not alone. I noticed on more than a few occasions, other cars randomly stop and rip up signs, too. We’re out there. We’re creative. And we’re going to repurpose these signs—originally meant to weaken our community—as a way to strengthen our neighborhoods and build stronger relationships with each other.